It would be folly to try to capture everything we experienced on our visit to Washington, DC (pics). Even though I lived here 27 years ago and visited many of the same sites, it’s been so long it was like a new experience. 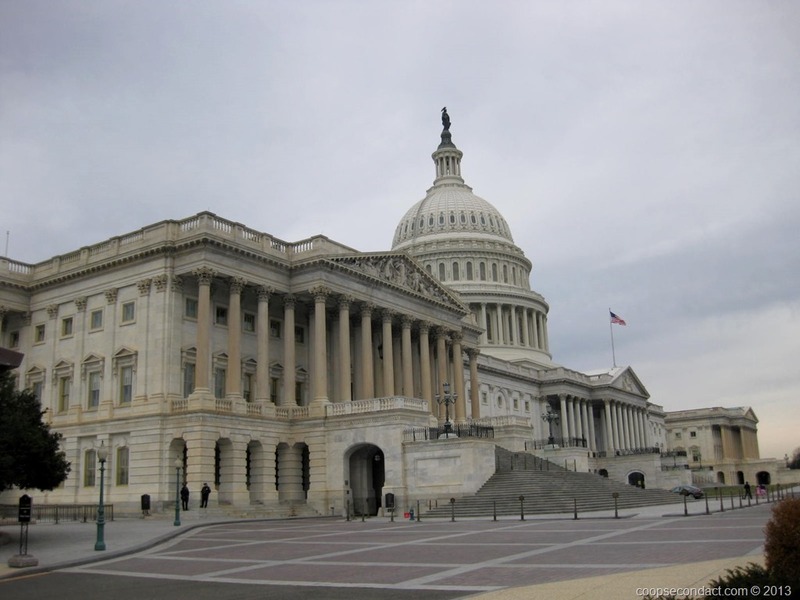 In this first part I will show our visit to the US Capitol and the Library of Congress. The public tour of the Capitol is a little limited in that it does not include the current Senate and House Chambers. In order to see those you must prearrange your visit through the office of your Senator or Representative. For the public tour you begin in the Visitor’s Center where you will view a 17 minute film before you break into a smaller group for the walking tour. While in the Visitor’s Center, you can view the “Statue of Freedom” which is a full size representation of the statue that stands atop the Capitol dome. The Capitol rotunda was the highlight of the tour for me. It is very large and really beautiful. It’s not possible for a photo to capture what it feels like to stand in this room. Your eyes keep finding more and more as you scan from floor level up to the inside of the dome. 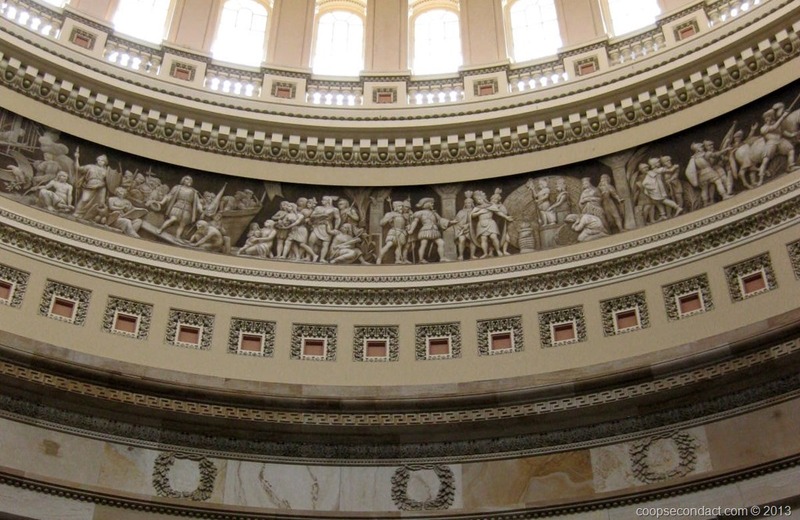 One of the elements in the rotunda is the “Frieze of American History” which is painted to appear as a carved stone bas-relief frieze that depicts 19 scenes from American history. The original designer began painting in 1878 and completed seven and one-half scenes before his death in 1880. Another painter was commissioned to complete it using the original sketches, finishing the painting in 1889. The Thomas Jefferson Building is the centerpiece and the original building of the Library of Congress. This building, opened in 1897 was built in the Italian Renaissance style. The Great Hall is the centerpiece of the building with a ceiling seventy-five feet above the marble floor. It’s difficult for me to imagine that someone could conceive of something so beautiful. It’s a little overwhelming. Just to select an example: Two marble staircases flank the Great Hall. The small children carved into the railings represent various occupations and hobbies, including the symbol of a trade: a hunter with a rabbit; and electrician holding a telephone receiver; and an entomologist with a butterfly net. The Main Reading Room’s domed ceiling rises 160 feet above the floor. In the circular mural at the apex of the dome, twelve figures represent the countries, cultures, and eras that contributed to the development of Western civilization as understood in 1897. 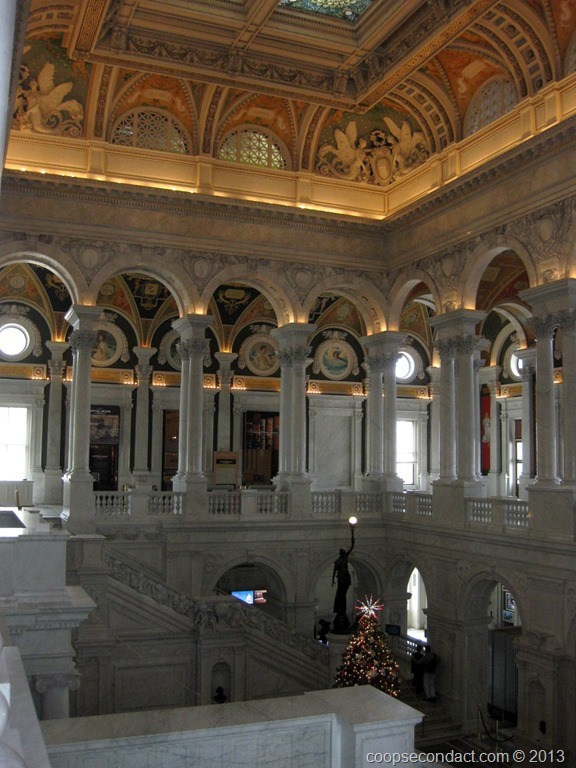 Visitors to the Library of Congress are not allowed to enter the room but are able to view it from from an overlook.